Adventurers, scientists, artists, workers, and visionaries — these are the men and women you will encounter in the short fiction of Kim Stanley Robinson. In settings ranging from the sunken ruins of Venice to the upper reaches of the Himalayas to the terraformed surface of Mars itself, and through themes of environmental sustainability, social justice, personal responsibility, sports, adventure, and fun, Robinson's protagonists explore a world which stands in sharp contrast to many of the traditional locales and mores of science fiction, presenting instead a world in which Utopia rests within our grasp. 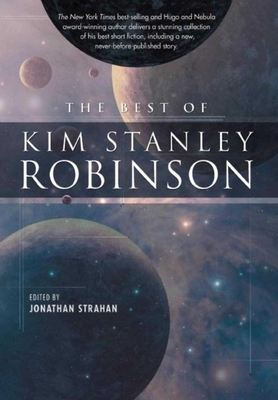 Award-winning editor Jonathan Strahan worked with Kim Stanley Robinson to select the stories that make up this landmark volume. In addition to these reprints, The Best of Kim Stanley Robinson features a brand-new short story, "The Timpanist of the Berlin Philharmonic, 1942." From Kim Stanley Robinson, award-winning author of the Mars Trilogy, the Three Californias Trilogy, the Science in the Capital series, The Martians, and The Years of Rice and Salt, comes The Best of Kim Stanley Robinson. These twenty-two stories, including the Nebula Award-winning "The Blind Geometer," and World Fantasy Award winner "Black Air" represent The Best of Kim Stanley Robinson.